While the average budget for ioby projects is around $4,000, many are larger scale. If you have your sights set high, your budget—and fundraising skills—will have to rise to the challenge. Crowdfunding large amounts of money on ioby is totally doable, but it takes some extra planning. In our Rainmakers series, we’re sharing stories and tips from Leaders who have successfully raised $10,000 or more for their ioby campaign. Learn how they did it, and how you can do it, too! 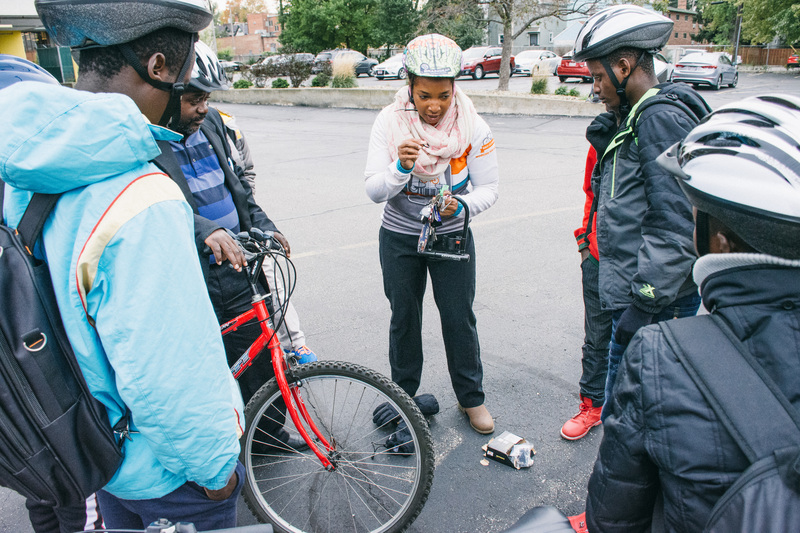 The Cleveland Refugee Bike Project is working to improve mobility—both physical and social—for the city’s refugee community by providing them with bicycles to ride and the training and tools necessary to become safe and self-sufficient riders. ioby Leader Tim Kovach let us in on how he raised over $13,000 last fall to launch this ambitious project this spring. 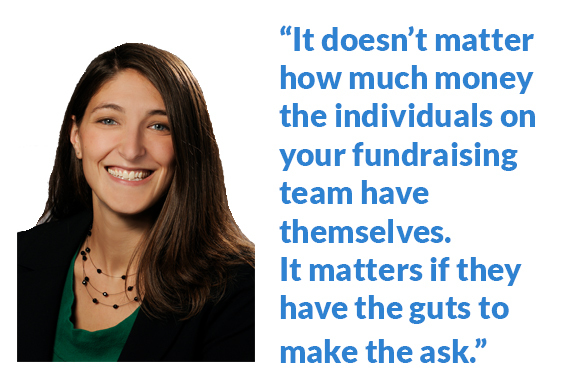 Q: Who was on your fundraising team? I saw my job as bridging the gap between the bike and refugee services communities, so I chose my partners very deliberately. I bike a lot and do volunteer advocacy work with the Ohio City Bicycle Co-Op and Bike Cleveland, so I had personal relationships with them and approached them that way. My wife happens to work at Catholic Charities: they run the largest refugee resettlement program in Northern Ohio, and are a member of the The Refugee Services Collaborative of Greater Cleveland. So my connections in both worlds gave me access to both donor pools. Cleveland has been trying to make itself as welcoming a community as possible for refugees and immigrants, so we had a lot of good connections and reception from that side. 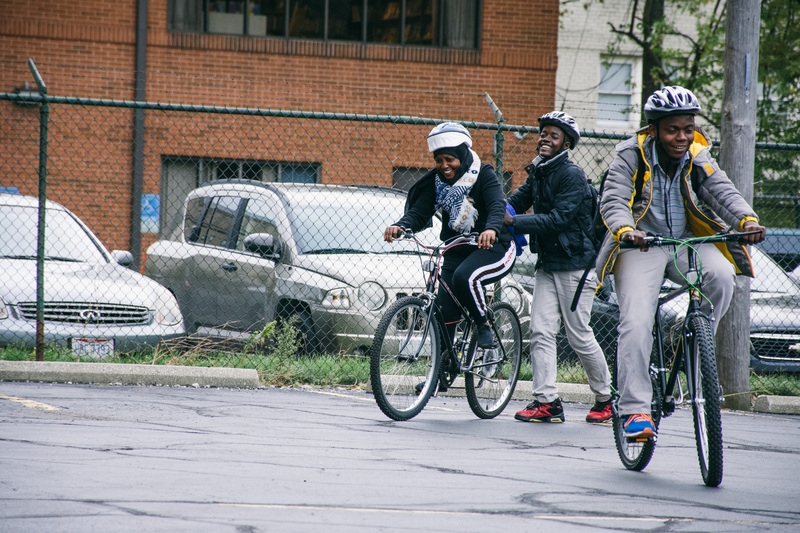 On the bike side, Cleveland has been going through some growing pains to become a bike-friendlier city—it’s happening in fits and starts—there’s lots of grassroots momentum there. Through one tragic event, I saw there was a lot of fundraising potential in our bike community. A local bike luminary, Shelli Snyder, was critically injured while biking from Ohio to Seattle last year, and her peers raised tens of thousands of dollars for her recovery. That showed us there was a lot of support here for bike-related concerns. I approached the directors of both bike organizations in January 2016 to pitch it to them, but the idea didn’t go anywhere until late summer or early fall, when we knew more about how it would be funded: through crowdfunding on ioby and through the Cleveland Climate Action Fund, which gave us $5,000. Q: Were you already comfortable with asking for money? No, I’m not really the fundraising type. I’m a very quiet, reserved person, so this was not comfortable to me, and it was all fairly new. I did solicit family and friends through social media, phone calls, and face to face. My sister-in-law is a refugee herself, so my brother was very generous. It wasn’t the easiest thing I’ve ever done, but I got a good response—though my asks didn’t comprise the lion’s share of what we made. Fortunately, I was able to partner with people who had more skills in this area. The Ohio City Bicycle Co-Op and Bike Cleveland are both very small—less than 10 people each. But the directors of both organizations put asks in their newsletters and made personal requests of their contacts. Catholic Charities is obviously bigger, and they put the word out on their social media. It’s definitely easier to work with a small local organization than a national one. The potential for donations is larger with the latter, but there are more layers of bureaucracy to communicate through. I found that personal relationships were important to this campaign across the board. Cleveland is a small city; you run into the same people over and over. That can be a problem when it comes donor fatigue, but unexpectedly catching someone can also be a great way to have that conversation you wanted to have. This familiarity definitely came into play when it came to hosting a fundraiser. My wife and I live near a brew pub called Platform that we knew had hosted such events in the past. I approached the manager in person, he agreed to have us, and we raised a few hundred dollars in a few hours via cash donations and a percentage of beer sales. Q: How did you plan your fundraising? We developed the budget and program plan systematically. I costed out a few things, then asked my partners for feedback. The bike co-op is hosting a lot of the project’s trainings, so they knew how much that part would cost; the same went for Catholic Charities, who provided the translators. With these numbers, I initially drew up a budget for 50-plus participants as a pilot. That wound up growing to 100 participants as we raised more money. The fundraising effort was a little more by the seat of our pants. I relied a lot on the organizations to contact their donor lists, I made my own list of who I should ask, and I cobbled together targeted social media efforts as I went along. On social, I made an effort to go for people I knew had a lot of connections. For instance, I noticed that a reporter for a local blog was putting together a list of local organizations who were accepting different kinds of donations. I asked her if she’d include us, and she did. There was a lot of happenstance like that. Q: How did storytelling factor in? It was challenging on one hand because there are privacy concerns with sharing info about refugees, for their safety. You don’t want to get into too much detail, so just we said there’s a need and there’s an interest: that it’s been difficult for refugees to get bikes, and there have been incidents where people have been injured. But I did try to share my own story of how we got to where we were, why this issue was important, and more about this mobility gap we wanted to bridge. Interestingly, the campaign deadline was November 18 of last year, and we found that we kind of plateaued about two weeks before the presidential election on November 8. After the election, it was evident that people really wanted to do something, and we were there with some issues that were really at the heart of the election: immigration, refugees, climate change, transportation equity, human dignity… So that timing wound up really working to our advantage. Donations surged and got us to our original goal, then to our stretch goal. Another aspect of storytelling that really helped was earned media recognition. There’s a local blog that does feel-good stories, and they wrote about us. While I thought they focused too much on me—that’s not my cup of tea!—it did help spread the word. We also appeared on the WCPN radio program The Sound of Ideas around the time we hit our goal. They wanted to do a show about refugee issues a week or so after the election, and reached out to us. Q: What methods did you use to ask people? I was pleasantly surprised by how effective creating a Twitter account for the project was: for raising money as well as for thanking and appreciating donors. But the larger donations we got—above $100—all came from direct asks to people, made either by me or our partner organizations. In those cases, personal emails were probably the most effective method. Q: Did fundraising help with community buy-in? Sure. In addition to donating, or in lieu of it, some people said they would like to volunteer, donate bike paraphernalia, or help us get the word out. Those were beneficial outcomes for sure. As you would expect, given the political climate and the nature of the program, there were a few less than kind comments made and messages shared. But then we saw a lot of vocal supporters step up to “drown out the haters,” so to speak. It’s important to set a realistic fundraising target and justify how you got to that number; people will want to know. ioby training taught me to break it down this way: If you give us $75, that will buy a bike; $25 will buy an hour of interpretation; etc. Giving concrete examples of where the money’s going encourages donors to feel ownership. Don’t be afraid to ask your family and friends; they’re the ones most likely to support you if they can. Partner with good organizations that have experience in your topic area and good donor lists. Harness their skills and connect with their constituencies. While ioby cautions not to rely too heavily on social media, I found it to work pretty well, though I understand that might not be the case for everyone. Have a story to tell. People want to hear it. I had to figure out how to do that without divulging too much private information, but in any case, work to tell an engaging story of some kind. People will feel like they have a stake in what you’re doing if they know where you’re coming from and are sharing something personal with them. 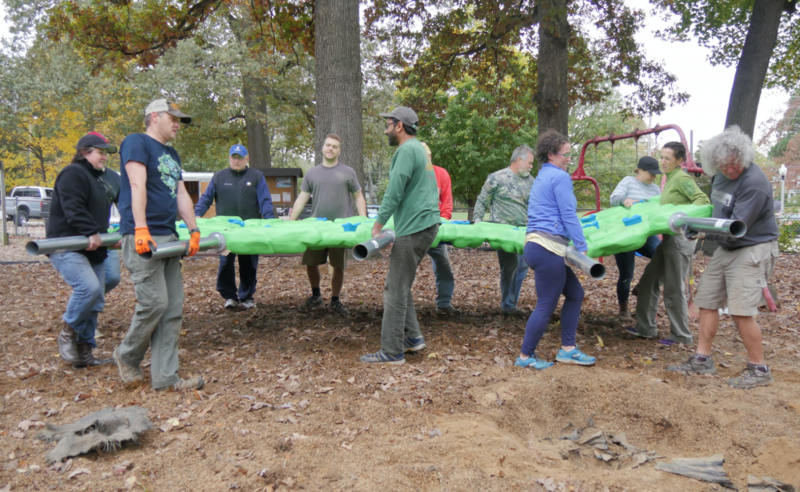 Below, Lee explains how she and her fundraising crew crowdfunded over $14K to restore this neighborhood favorite to its former glory for the next generation of Memphis families. We were made up of a few parents, the pastor from the church on the lot where the playground is located, and the principal of the new Montessori school that opened up when the old preschool closed. It was a very good mix; it gave us lots of different connections. Two of the moms in the group were especially well-connected in the community, and one had worked on ioby campaigns before, so that was really helpful. As simple as the process is, it can be intimidating, so we appreciated all her knowledge. Another woman was a grant writer, or something similar, for a living. She kept us on task and super organized, delegating tasks and keeping everyone accountable. That’s something I’d be terrible at!, but she killed it. I didn’t have much experience with it, and I was not comfortable. 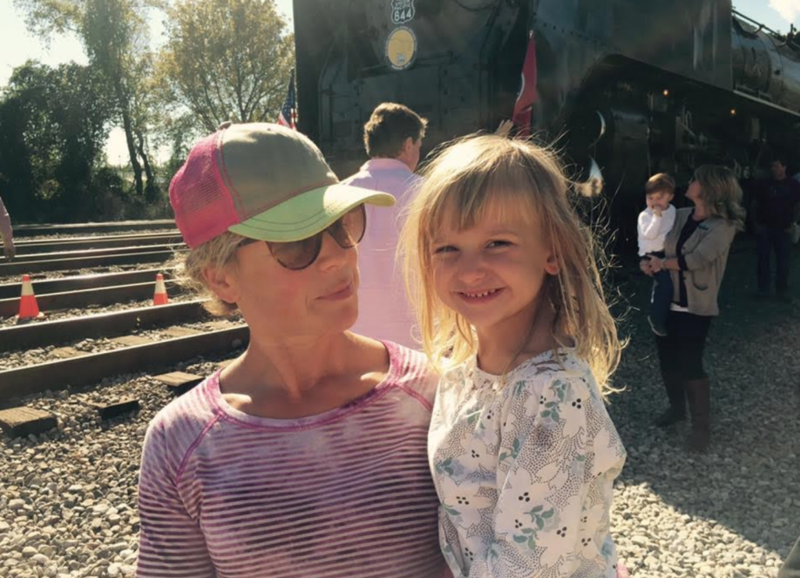 But I do use social media, so what really worked for me was writing a very personal, heartfelt Facebook post about what the playground meant to me, and what I knew it meant to other parents, and that really resonated with people. I talked about how this wasn’t just a place where kids played—it was also where parents talked to each other and had little therapy sessions together! Someone still had info on file about the person who had helped build the original playground 10 or 12 years before, so we contacted him and explained our situation. We told him about the equipment we wanted and he helped us figure out how much everything would cost, the price of delivery, what we could do ourselves versus what we’d need to hire someone to do, etc. That was how we figured out our budget. Then we just started asking. I have to say I got some crazy support. Friends of mine in San Francisco gave us $250 just ’cause they’re awesome—I never would have imagined it! Another friend gave me a significant amount because I had supported his projects in the past; it was a reciprocal thing. He doesn’t even have kids. Remember that support comes in many forms. Not everyone can give $250, but maybe they can give $25. In our case, some folks said they couldn’t give anything, but they appreciated the idea and wanted to come help us with the physical work. People will respond differently. Also, we didn’t ask for money at year-end, which is when everyone gets hit up. We ran our campaign in the springtime, which I think helped. Our only big storytelling push was the Facebook posts—another woman on our team wrote one, too. I think we were already somewhere around the $8K mark when when did those, and they helped push us to our goal. We must just have really generous neighbors and friends who were moved by reading these personal stories! We did share the posts around widely; as widely as we could. 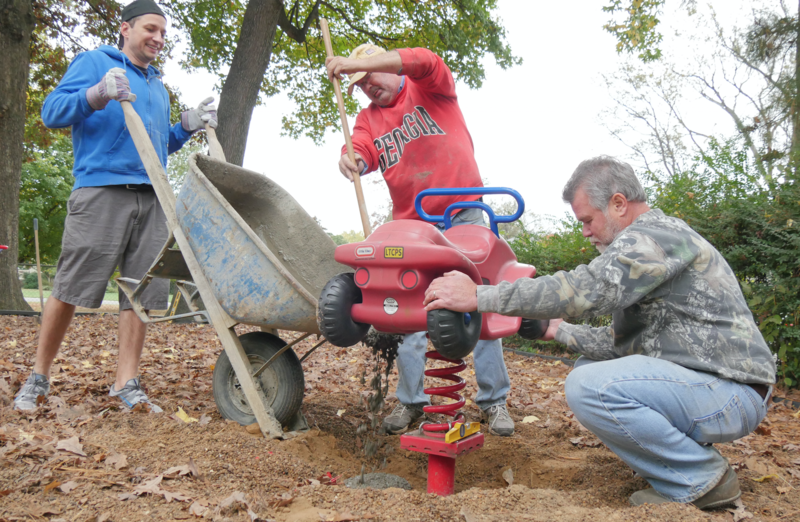 The fact that so many people responded by donating showed us that the playground really does mean a lot to people—even those whose kids had moved away or who had outgrown it. I sent several personal emails to friends with a link to the campaign, as well as to some older church members who I have a relationship with and who I thought could afford to donate, and they did. Even though their kids are now older, they used to have a relationship with the playground, and apparently that endured. Interestingly, I don’t think anybody told me “no.” They either gave something or just didn’t reply. One of our members sent all of us in the fundraising group an email with things to note and do: a schedule with month by month project tasks, a budget breakdown, etc. I don’t think anyone had a call roster, but we stayed pretty organized, thanks to her. I definitely thought about the project as community building. It brought together parents whose kids go to the playground now, parents whose kids used to go, families who knew the preschool that closed, people from the new school that opened up, church members… I think it helped that we could appeal to people who were familiar with the past of the place and had memories there as well as people who could envision using it in the future. Figure out a way to make a personal connection. Write out your personal story. Even if you’re fundraising for something like a new community garden that doesn’t exist yet, there is a way to connect with people about the space and make your point resonate with them. You can focus on yourself and what you love about it, or focus on how you can see other people enjoying it—you just have to forge a point of connection, some common ground. We did it both ways: we remembered what it was like for us, and we also described how we imagined it being for the next generation of kids. A few months back, Aylene McCallum, Director of Downtown Environment for the Downtown Denver Partnership (DDP), walked us through the steps she took to bring the city’s Arapahoe Street Protected Bike Lane project from vision to reality. Her initial budget of $155,000 was partially covered by grants from the Gates Family Foundation and Downtown Denver Business Improvement District, but that still left her with $35,000 of crowdfunding to do. We spoke to Aylene again, to get into the nitty-gritty of the fundraising strategies she employed and lessons she learned from her years (yes, years!) of working to improve quality of life in downtown Denver. Our team was made up of 20-ish diverse volunteers who really wanted to fundraise and contribute to creating a more bike-friendly downtown. We had business leaders, transportation people, real estate developers, foundation employees, community organizers, architects, political advisers… But they all believed in our shared goal. It’s okay—and can even be ideal—to have a large steering committee like this. It helps you tap into more networks, spread the word, and build support more widely. You want people with different types of connections. If you have five best friends on your committee, they’ll probably all know the same people! That said, don’t pick random people just for diversity’s sake. Make sure everyone you invite understands the importance of the project and is personally passionate about it: those who are are genuine will make a better effort to fundraise. This requires careful cultivation, so don’t rush it, if at all possible. You also need to take the time to prep everyone about what’s entailed and what’s expected. But you don’t want to draw these processes out forever, either! It’s all a balance. It doesn’t matter how much money the individuals on your fundraising team have themselves. It matters if they have the guts to make the ask, it matters who they’re connected to, and it matters how committed they are to the cause. In the end, probably the most important thing is that you have a very strong, committed, inspiring leader to whip them into shape! This probably should not be you, since you’ll have so much else to do, but you should absolutely support this person. I had been raising sponsorship money for DDP events for a while before this, so I was very comfortable asking people to donate directly. What I really welcomed ioby’s help with was teaching my fundraising team how to ask for money. I credit ioby for counseling me through that effort and giving me great ideas about how to engage the committee. One lesson I learned is that you should communicate constantly with your team. Don’t doubt that they’re making the asks, and trust them that they’ll deliver, but do help them stay accountable and organized, and keep the momentum up by staying in close touch. I set lots of goals for my committee so they could understand what success looked like for their effort. “If everyone on the team brings in five people who can give $250, we’ll make our goals…” Really mapping it all out helps keep energy up through the whole campaign. When you see a superstar team member doing great, throw them some love; shout them out to the rest of the committee. “Hey everyone, I saw Mike brought in $1,000 today—great work!” It shows them all that asking does work, that success is being achieved, and that they’re making it happen. This is another area where the more people you bring into the process, the better—on both the funding and the partner side. The breadth of your network is critically important to your success—in fundraising and for your project in general. More people equals more opportunities. I am not a communications person! I kind of get it, but I’m not in the marketing department. I really had to learn along the way. One thing I realized is that we had two different stories here with two different life cycles: the fundraising phase and then the larger picture of the whole project. The fundraising story was about why bike lanes are good for cities. The larger story was more about the private and public sectors coming together and stretching what each of them normally does. I don’t think we got a lot of donations because of our story being in the national or local media; our fundraising success really came from the individual work of our task force members. The media does a good job of raising awareness, but it usually isn’t until someone asks you personally to donate that you get serious about giving. So you really can’t count on the media to bring in your money; you have to plan personal asks. We used a combination of what seemed most appropriate and most effective. If you think the person you want to ask is good with email, write to them. If you’re going to see them, ask in person. Plan your asks in waves. It’s hard to ask hundreds of people consistently for the duration of your campaign; you’ll lose your stamina. We put a bunch of asks out in an initial wave and then sat back to watch and assess, and we used what we learned from that wave to plan for a second. We thought of some new people to ask—and asked some of the same people again—with improved tactics. You can even try doing a third wave to check up on anyone who said they wanted to give but didn’t yet. In every case, there can be a fine line between nudging and bugging—that’s where the personal relationships can really help out. We had one committee member who was a very prominent business person in the community. One day he said, Come to my office and we’ll make some calls. I sat with him for an hour and he called friend after friend to ask them to give. We got so many donors! That was a very productive hour of our time, and I remember being surprised that he was willing to do it. The lesson there: don’t doubt how much people want to help you. You never know who’s going to step up, and what connections they have. Build time into your work plan for assessing and responding to whatever happens right after your crowdfunding campaign; don’t jump into another project right afterward. You want to be able to leverage the success you achieved here in your next project, not let it go cold. Don’t be so busy doing the next thing that you can’t fully capitalize on your project’s success. Send lots of thank-you notes. Lots of them!